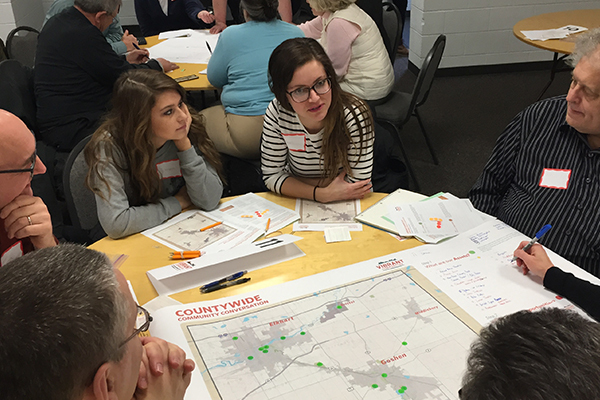 More than 500 Elkhart County residents have already participated in Vibrant Communities Community Conversations, sharing what they love about the places they live and what they want to see in the future. The energy in each of the five meeting locations has been excellent. Estimated attendance for each meeting was Elkhart (175), Goshen (115), countywide (110 over two time periods), Middlebury/Bristol (75) and Nappanee/Wakarusa (65). 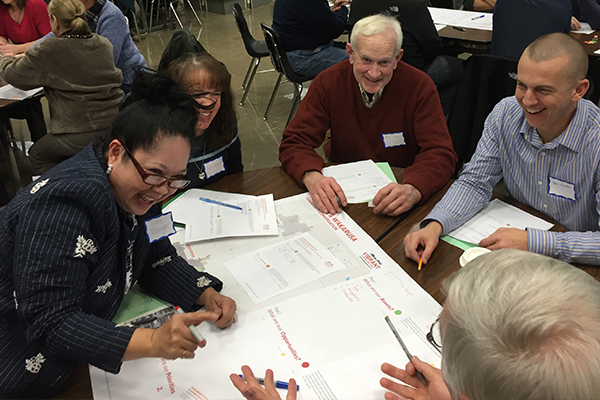 In each Community Conversation, groups of eight to 10 people have huddled to offer up some amazing ideas. 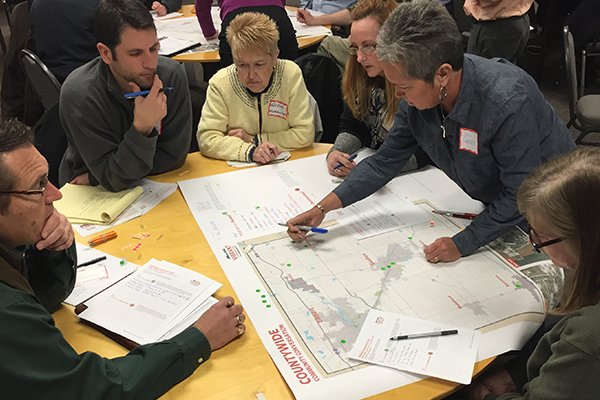 Among the ideas have been: a community center in Goshen for concerts, events and family gatherings; an IMAX theater in Elkhart; more dog parks; more arts and recreational activities geared specifically to children; expansion of bike/walking trails; and food trucks. More fantastic ideas are anticipated as the Vibrant Communities moves into its next phase of receiving feedback. This includes smaller informal meetings convened by individuals in homes, church fellowship halls or other places. These meetings are a guided discussion similar to what happened in the Community Conversations. To receive a “meeting in an envelope,” contact Terry Mark of the Elkhart County Convention & Visitors Bureau at terry@amishcountry.org. An online feedback tool will also be accessible at www.VibrantElkhartCounty.org and a printed survey will also be distributed at community events and meeting places. 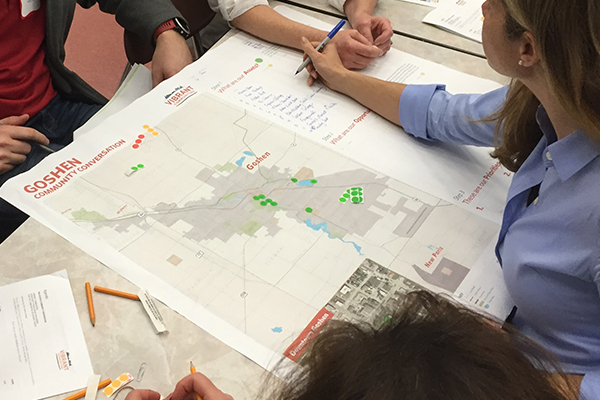 The Vibrant Communities initiative seeks to bring Elkhart County together to evaluate existing quality-of-place amenities and such as arts and cultural venues and programs, parks and walking/biking trails, and other recreation opportunities. The process will result in a community-driven Action Agenda around starting new amenities while sustaining and improving upon existing quality-of-place assets. The draft Action Agenda arising from these discussions will be presented for further public feedback in early May. The Vibrant Communities initiative is co-sponsored by the Community Foundation of Elkhart County and the Elkhart County Convention & Visitors Bureau. The two organizations are dedicated to quality-of-place projects which improve Elkhart County communities and economic interests. 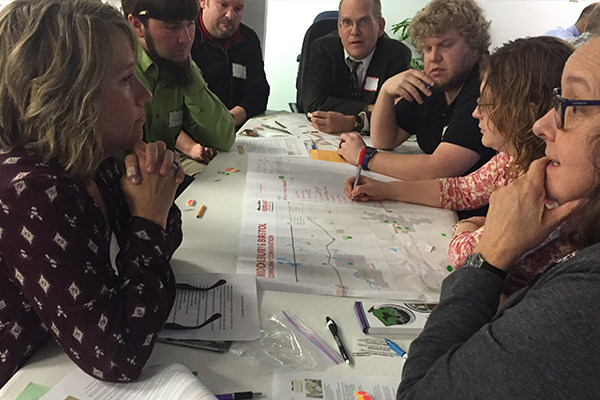 Vibrant Communities is being assisted by planning-NEXT, a consulting firm from Columbus, Ohio, as process facilitators.